The eastern Iowa town of Riverside has long claimed to be the future birthplace of the fictional "Star Trek" hero James Kirk, but the new blockbuster movie in the series is making some Trek loyalists as angry as Klingons in a room full of tribbles. It’s clear in the film, which debuted at number-one in box offices nationwide last week, the iconic Captain Kirk was actually born in deep space on a shuttle craft, but did grow up in Iowa. Carol Riggan is president of the Riverside Area Community Club, which hosts the annual Trekfest. Riggan says Riverside will remain the "future birthplace" of the starship captain. "We feel that he was conceived in Riverside," Riggan says. "We have a plaque there where he was conceived at Murphy’s Bar and Grill, underneath a pool table. I talked to many people and they think this little bit of change with this new movie will not hurt us a bit." Not all Riverside residents are as forgiving of the new film. Tim Geerlings, the vice president of the Riverside club, says he was stunned by the mishandling of the Kirk story line. "There’s a lot of nerdy physics phenomena that operate in this movie that were a little disconcerting anyway, but then when they stripped the birth of Captain Kirk away from our future, at least in one parallel universe, it muddies the waters," Geerling says. "If Captain Kirk will be born in Riverside, which Captain Kirk? Which parallel universe?" The movie involves a villain who travels through time and changes the course of Star Trek history, which is one area where Geerling takes exception to the plot. "I’m not sure about time travel," Geerlings says. "Even Stephen Hawking doesn’t believe in time travel. The scenario being, if you go back in time and kill your grandmother you would not be here in order to go back in time and kill your grandmother. It’s an impossible loop." The future-Iowa is featured prominently in several scenes in the new movie and Riverside is even made the home to a large spaceship-building port where the famed USS Enterprise is seen under construction. While Geerlings says the movie itself was "action-packed and exciting," he wishes the Hollywood people had taken a different course. Geerlings says, "It didn’t seem like the writers were too concerned about keeping the folklore intact, so that kind of upset me a little bit." The new Star Trek film is the 11th film in the series. It’s considered a "prequel," exploring the early lives of the Starfleet heroes who were first introduced in the TV show that debuted in 1966. 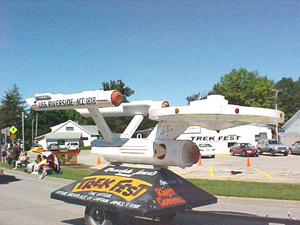 Riverside is hosting its 25th annual Trekfest on June 26th and 27th, and will feature three cast members from the original series: Walter Koenig, Nichelle Nichols and George Takei, who played Chekov, Uhura and Sulu.